Inspiring Art Teachers to Explore Art History | Curator’s Corner: New Acquisitions Month: Yucky Still Life? I’ve decided to dedicate my June posts to a series highlighting new images in Davis Art Images’ digital collection that have either blown me away, or, in the least, charmed me. Whenever I accession new images into our collection, I have what I call “epiphany moments,” caused by seeing a contemporary artist’s work I’ve never seen before, or just some awesome piece of art from the past. Epiphany moments happen on a regular basis in the work I do with acquiring new images, and it is a pleasure to share them with you for the beginning of SUMMER! This week’s image features the kind of cabbage I wish I could find in my local Price Chopper, although without the bugs. Artists of the Renaissance (ca. 1400–1600) in Western Europe took a strong interest in realistic fidelity as a major sign of quality in painting and sculpture. That included meticulous rendering of things observed such as architecture, drapery, still life, and landscape. Starting in the 16th century, particularly in Northern Europe, many of these categories, once only an integrated part of history or religious painting, became independent subjects. In Italy, this phenomenon happened in the late 17th century. Still life, landscape, genre scenes (scenes of everyday life), and architectural illustration were particularly popular in Northern Europe especially after the Protestant Reformation (early 16th century), which frowned upon religious imagery. Although Baroque art (ca. 1600–1750) of the Netherlands reveled in imagery of the everyday world, including still life, it was not without moralistic content. Still life was often a vehicle for symbolic flowers. In this still life, the luscious cabbage is not the main emphasis. It is rather the butterflies, a symbol in the Baroque artist’s mind, of the freedom of the soul after death, or of resurrection (from caterpillar to butterfly). The very fact that bugs surround this edible morsel represents the idea of imminent decay, something which human beings had to contemplate and come to terms with before the Last Judgment. Decaying vegetables were symbolic of the transience of human life and the importance of the spiritual life. The cabbage, in Dutch art, was also a symbol of a spendthrift life (excess luxury), but also, peeling back the layers of a cabbage was symbolic of the various stages of the Christian soul’s journey to the divine. Can I just say what a brilliant watercolor this is?! I had a terrible time with watercolor when I was in grad school, and turned to oils. 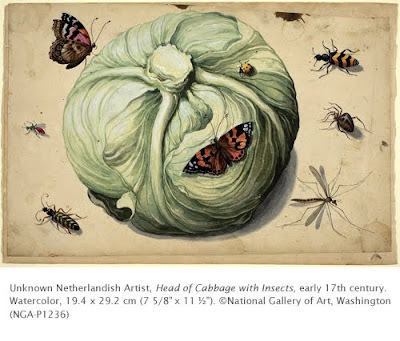 This brilliant little piece is so detailed, it reminds me of botanical studies done (it may well have been one) during the late Renaissance and Baroque periods. Take a look at some additional Dutch Baroque still life paintings to see more evidence of decay in art.